This composite X-ray (blue)/radio (pink) image of the galaxy cluster Abell 400 shows radio jets immersed in a vast cloud of multimillion degree X-ray emitting gas that pervades the cluster. 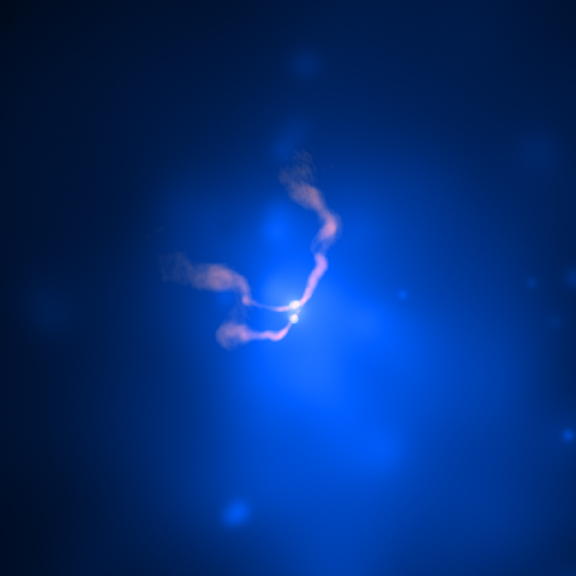 The jets emanate from the vicinity of two supermassive black holes (bright spots in the image). These black holes are in the dumbbell galaxy NGC 1128 (see optical image), which has produced the giant radio source, 3C 75. The peculiar dumbbell structure of this galaxy is thought to be due to two large galaxies that are in the process of merging. Such mergers are common in the relatively congested environment of galaxy clusters. An alternative hypothesis is that the apparent structure is the result of a coincidence in time when the two galaxies are passing one another, like ships in the cosmic sea. Careful analysis of the recent Chandra and radio data on 3C 75 indicates that the galaxies and their supermassive black holes are indeed bound together by their mutual gravity. By using the shape and direction of the radio jets, astronomers were able to determine the direction of the motion of the black holes. The swept-back appearance of the radio jets is produced by the rapid motion of the galaxy through the hot gas of the cluster, in much the same way that a motorcyclist's scarf is swept back while speeding down the road. The binary black holes in 3C 75 are about 25,000 light years apart. They are likely at an earlier stage in their evolution than the pair found in NGC 6240, which are about 3,000 light years apart. Computer simulations indicate that binary supermassive black holes gradually spiral toward each other until they coalesce to form a single, more massive black hole, accompanied by an enormous burst of gravitational waves. These gravitational waves would spread through the Universe and produce ripples in the fabric of space, which would appear as minute changes in the distance between any two points. Sensitive gravitational wave detectors scheduled to be operational in the next decade could detect one of these events, which are estimated to occur several times each year in the observable Universe. Coordinates (J2000) RA 02h 57m 41.58s | Dec +06° 01´ 28.81"